Does anyone else feel like Thanksgiving is SO early this year?! Five minutes ago it was summer, then the leaves were falling, then we had a bit of snow last week(! ), so needless to say, it’s suddenly holiday season! 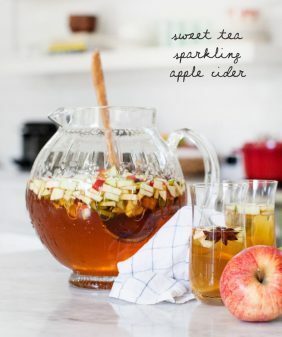 Whether you’re hosting the big meal or you’ve been assigned to bring a salad or side dish, here are a few recipe ideas. This is a short list of recipes that are my favorites right now. There are also tons more listed under the Thanksgiving tab of our recipe index. 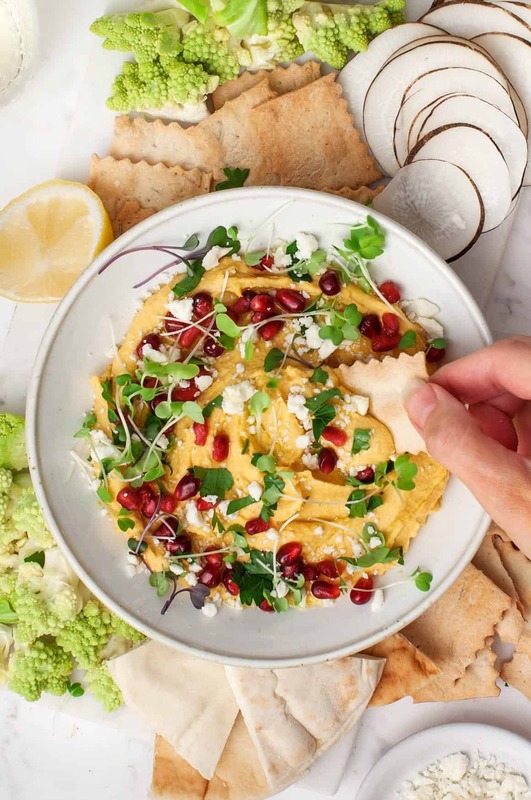 Start the meal off with this Butternut Squash Hummus. In my opinion, this is the best fall dip. It’s creamy, it’s squashy, and it’s nicely spiced with cumin and coriander. Make it extra fancy (and extra delicious) by sprinkling it with feta cheese and pomegranates. Stuffing is always my favorite part of the meal. Here are two versions that I love because they pack a decent amount of vegetables in between the bread. This Kale & Shiitake Mushroom Stuffing is rich with celery, rosemary, a touch of balsamic vinegar, cranberries, and savory sage leaves. An umami-tastic stuffing. Stuffing option number two is this Butternut Squash & Leek Stuffing that I made last year. I love it because it’s so colorful from the squash, herbs, and little purple cipollini onions. Cauliflower Parsnip Mash with Roasted Garlic is a non-traditional mash because, well, it’s not actually made with potatoes. I just love the nutty, earthy, complex flavors from the parsnips and the roasted garlic. 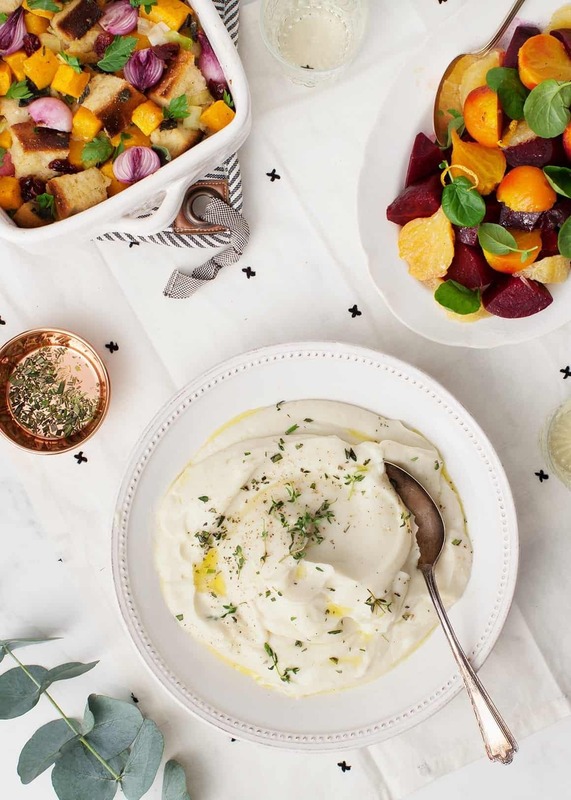 For a more traditional mash, make these Vegan Cauliflower Mashed Potatoes. Cauliflower subs in for half of the potatoes, making them smooth, fluffy, and light. Then, of coarse, there are these Kale & Olive Oil Mashed Potatoes that I posted the other day. 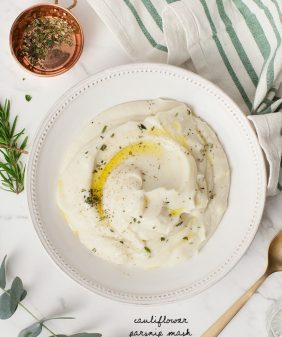 This recipe makes a “rustic” mash, which is my way of saying that it’s a no-peel dish with a wonderful chunky texture and lots of flavor. For a veggie main course (or a nice side dish) try this Acorn Squash with Chickpeas & Chimchurri. 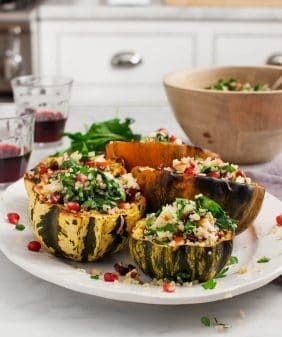 The bright flavors here are anything but traditional, but it’s such a cozy and delicious stuffed squash recipe. Keep the vegetable side dishes simple – you’re cooking enough already! These Simple Roasted Beets with Citrus will brighten up the whole meal while keeping your grocery list short. 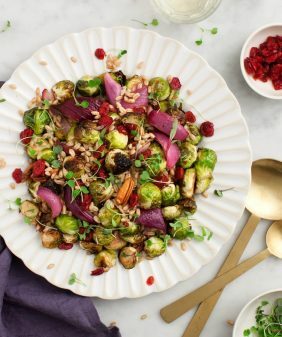 If you’ve been assigned the salad, this colorful Fall Farro Salad with Halloumi & Pomegrantaes is sure to impress. Or for a quicker easy-to-bring salad, make this Shredded Brussels Sprout & Cranberry Salad. It’s so tasty with so few ingredients. You can even buy the bag of pre-shredded Brussels sprouts – I won’t tell. For dessert, I’m obsessed with this Creamy Vegan Butternut Squash Pudding. To me, it tastes like the best pumpkin pie filling ever – the freshly roasted squash brings such wonderful natural sweetness. Last but not least – maybe you’re having an intimate Thanksgiving just for two? For so many years, Jack and I stayed home in lieu of dealing with crowded airports. 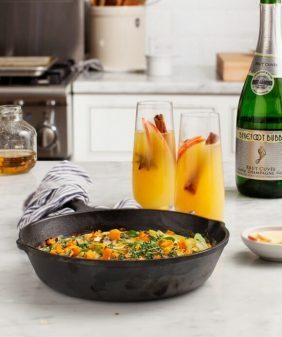 I’d always keep our dinner simple but festive by making butternut squash risotto… but you could spice things up by making this Butternut Squash Pasta with Chili Oil, Feta & Mint. 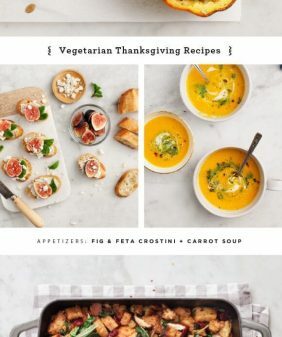 For more Thanksgiving recipes, check out our recipe index and click “Thanksgiving” on the right sidebar! These dishes look so appetizing. You did such a wonderful job showcasing the veggie sides!